Reaching from interior Alaska across Canada to Labrador and Newfoundland, North America’s boreal forest is the largest wilderness area left on the planet. It is critical habitat for billions of birds; more than 300 species regularly breed there. After the breeding season, many boreal birds migrate to seasonal habitats across the United States, Mexico, the Caribbean, and Central and South America. 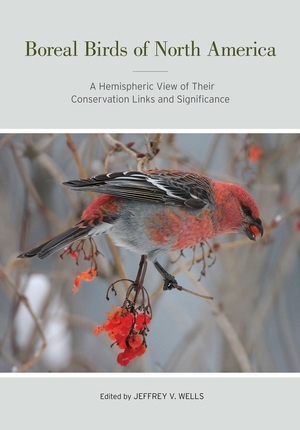 This volume brings together new research on boreal bird biology and conservation. It highlights the importance of the region to the global avifauna and to the connectivity between the boreal forest and ecoregions throughout the Americas. The contributions showcase a unique set of perspectives on the migration, wintering ecology, and conservation of bird communities that are tied to the boreal forest in ways that may not have been previously considered. Jeffrey V. Wells is Science and Policy Director of the Boreal Songbird Initiative and a Cornell University Visiting Fellow. He is the author of Birder’s Conservation Handbook, Birds of Sapsucker Woods, and Important Bird Areas in New York State.